Facebook’s API documentation for developers. Doesn’t sound like a fun thing to read during a rainy afternoon. But I did - I read every letter. And I’m glad I did, because what I found in there blew my mind. I’ve been running Facebook™ ads for many years. Both with my own money for various side-projects (software, online courses, affiliate offers and POD) and with a 1M+ ad budget at my corporate job. I mean I took courses from the gurus, ran a lot of experiments and followed blogs and podcasts from for example DigitalMarketer and Jon Loomer to make sure I was up-to-date on the latest news. Because Facebook™ makes changes all the time. Over the years I’ve seen the platform change, and I’ve seen the competition increase a lot (and CPM's skyrocket 🚀). You’ve probably noticed this too when you’re around for some time. And if you’re just new to Facebook™ ads you must’ve noticed that it’s not easy to get positive ROI. At least… not if you’re doing what everyone else is doing. If you’re fishing where everyone else is fishing so to say. But I was doing it all wrong. I did everything “as I was told”. I tested multiple images / videos, my copy, targeted relevant interests, etc. But it didn’t work - at least most of the times it didn't. A few years ago it was still OK, but competition became intense and more recently I really struggled to get a positive ROI on my campaigns. On cold-traffic that became close to impossible even. I started Google'ing like a maniac, looking for solutions. For fixes. So that rainy afternoon, I immersed myself in the Facebook™ developer’s docs to see if there was something in there that I could use to improve the performance of my campaigns. I found that Facebook hides most targetable interests. They just show 25 interest suggestions in the Facebook™ Ads Manager. And some more in Facebook™ Audience Insights (but most of these can’t even be targeted with ads). While there are MANY more. But they’re hidden in the Marketing API - that's luckily not only available to developers, but to anyone with a Facebook™ profile. This is what it looks like - and in the free workshop I'll teach you how to access it. It's probably the best kept Facebook™ ads secret because developers don’t run ads. And even found another interest targeting “trick” that no-one had ever told me. I thought about it a lot and I think the Facebook™ gurus know this, but they keep it a secret on purpose. Right after implementing I saw great results, but I was still anxious it would turn out to be wishful thinking - or a one-off lucky shot. And it outperformed every other campaign I ever ran. It was an experiment where I used interests to target 100% cold traffic. I created two identical ads that targeted the same set of interests - pointing to the exact same offer. In both ad sets I injected the strategy I named "interest hacking" and in the second ad set I also applied the "interest layering" strategy I teach in the free workshop. The results speak for itself I think…(sorry it's a bit small, I'll show all the numbers in the training). So $1 in - $3.19 out. This is 100% cold-traffic - in a very competitive niche...using just interest targeting. UPDATE: my new cold traffic ad sets are now at 531% ROAS, so $1 in - $5.13 out. … to me it’s clear now. Facebook™ hides interests and doesn’t explain the millions of advertisers on the platform HOW they should actually use interest based targeting. First I thought of selling my findings as a premium course, because literally no one else is showing this so I could easily charge a high price. Maybe I’ll do that later… for now it’s free (at least while the link below works). 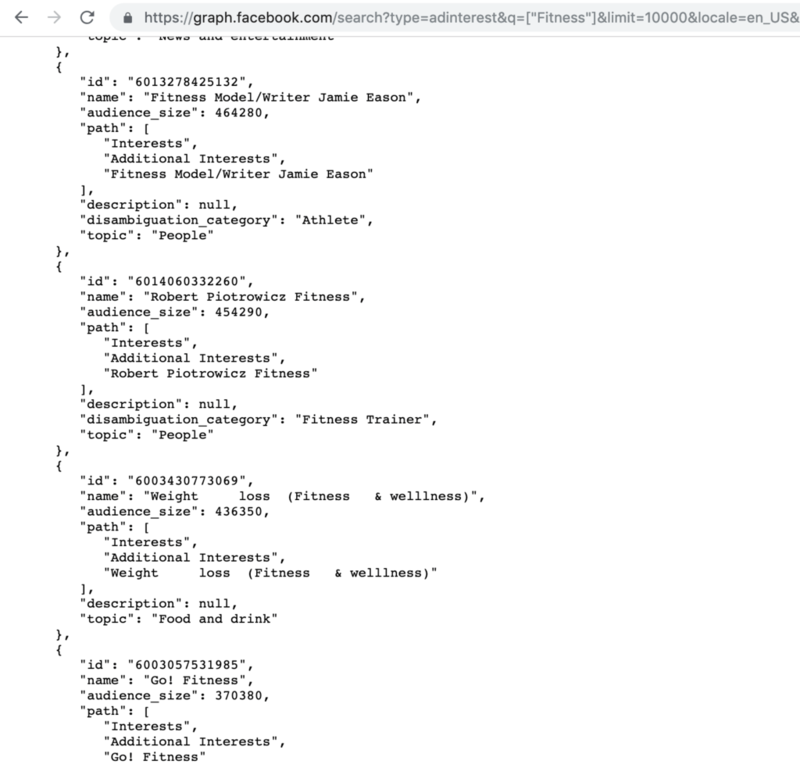 You’ll learn how to use the Facebook™ Marketing API to reveal interests that are hidden to most advertisers and how to fix your interest targeting by forcing Facebook™ to show your ads just to the passionate segments within your audience. It’s a hands-on workshop, but you don’t need to have any developer skills (just a few mouse clicks). Click on the button below to access the training. Did you scroll all the way to the bottom without reading? I discovered that Facebook™ hides many of the interests you can target AND I found a trick that skyrocketed my cold-traffic interest campaign to 319% ROI. I’ve created a training, that’s free (at least for now) where I teach you how I did it using the Facebook™ Marketing API. DISCLAIMER: The results stated above are my personal results. Please understand these are not typical and I’m not implying or promising you’ll duplicate them. I have the benefit of having 10+ years of experience running ads. The average person who follows any “how to” information gets little to no results. I’m using these results for example purposes only. Your results will vary and depend on many factors, including but not limited to your background, experience, and work ethic. All business entails risk as well as massive and consistent effort and action. If you’re not willing to accept that, this is not for you. This website in not a part of Facebook™. Additionally, this website is not endorsed by Facebook™ in any way. Facebook™ is a trademark of Facebook™, Inc.